SoCal offers low noise levels, ergonomics, maneuverability and ease of use are some of the variables that health care facilities managers need to consider when selecting floor cleaning equipment. They also should seek out equipment that can handle a variety of hospital flooring challenges as well as water conservation features that provide hygienic results. 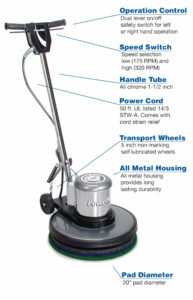 These features are available on the latest floor cleaning equipment, according to manufacturers that supply the nation’s hospitals. Equipment that is compact, maneuverable and has noise-dampening components increasingly is being used to clean patient rooms and other health care spaces. In addition, eco-friendly options are available that eliminate the need to use multiple chemicals, which ultimately reduces supply chain costs.